Did your earlier push for promotion from your current job fail? Recover by realistically identifying the reasons your bid went nowhere. Among the possibilities: Were you passed over because of how you’re falling short in your current job? Was it because you have certain correctable weaknesses? Was it because you don’t project a positive attitude with a smile on your face? Whatever the cause, you can take three steps to engineer a brighter tomorrow for your career. First, take an honest inventory of yourself as a candidate for promotion. What can you offer in a higher-level job, such as competencies, skills, judgment, and, most of all, profit-producing behaviors, to put yourself on a fast track with a promotion every couple years? Second, conceptualize a plan by figuring out how you can magnify your strengths and correct any deficiencies. Third, work your plan by drafting a statement with your persuasive facts onscreen or on paper. In requesting a promotion, write of your capacity for growth and what you’re doing about it, such as taking extension courses, learning through online training, or tapping subject experts in your network. Concentrate on the several most important areas in your work that will allow you to make and be recognized for important contributions. Fine-tune your timing. Commenting that a company expansion is on the horizon, noting that a promising new account has just come in the door, and observing that someone in your logical promotion path is about to leave the company are all examples of opportune times to make your pitch. The right timing isn’t when your company has just lost a major account or is surfing bankruptcy. A note of appreciation to an executive for allowing you to attend an industry seminar with your immediate boss is both appreciated and strategic. As career coach and author Donald Asher suggests, “Praise your immediate boss, explaining how much you and your boss learned and accomplished at that Chicago trade show.” This great idea is both subtle and effective. When asking for a promotion that would leave your current job vacant, mention that you’ve trained (or can train) one or more subordinates to seamlessly take over your job when you leave it. The message is clear: The work you accomplish for the company is being left in good hands when you’re elevated to the next level. Never claim that you’re indispensable. Your bosses may decide that you’re too valuable where you are, that your departure would leave a void, and that you can’t be replaced. 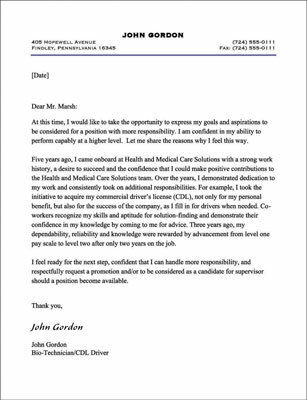 In this example, the employee seeking promotion doesn’t ask for an appointment, but instead hits the issue head-on with a letter to his manager asking for more responsibility and a higher-level position. Credit: Jane Roqueplot, CPBA, CWDP, CECC — West Middlesex, Pa.